There was no commercial bubble maker involved here; it was just made of assembled found parts. (The gallery allows photography as long as the photos weren’t reproduced on the internet, so out of respect for the gallery’s rules I did not take a photo of the work.) I’m intrigued that we’ve become so sensitized to ownership of rights that, rather than a simple “please do not touch,” operating the sculpture is characterized as a licensed right. 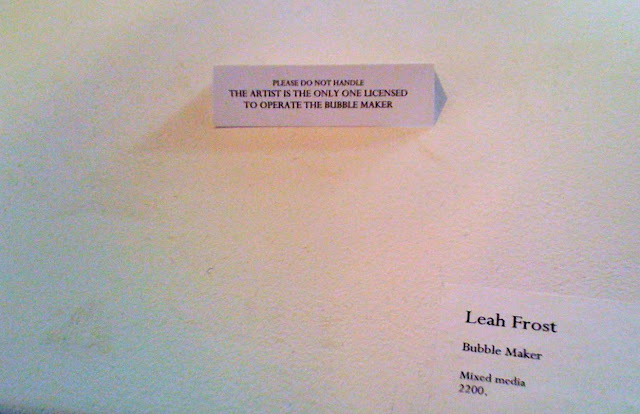 And a license granted by the artist to herself, no less. Hope the license is assignable.